Click an area of the map for world news. 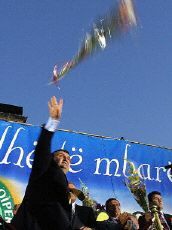 Better days: Ilir Meta throws flowers to supporters in Tirana, June 22, 2001 (Photo: AFP). More than 10 years after the collapse of the Soviet Union, Albania's fledgling democracy and capitalist economy are clearly not working. On Jan. 29, after a long, public, and acrimonious power struggle within the Albanian government, Albanian prime minister Ilir Meta resigned, leaving the ruling Socialist Party, and therefore Albania's government, split into warring factions. But as the politicians bicker, bankers complain that the instability is scaring foreign investors off at a time when the country needs all the foreign capital it can get. Foreign investors already had reason to be wary: bribery and graft had already inflated the cost of doing business in Albania. In recent weeks, Albania's power grid has been strained past its breaking point. Restrictions on electricity consumption and blackouts paralyze business for 20 hours a day. Many fear that if these problems are not resolved quickly, the country's government may face a total collapse. On Feb. 1, The International Monetary Fund informed Albanian officials that it has postponed a meeting to approve a US$30 million aid package until the current power struggle is resolved. In a separate development, the World Bank warned that US$70 million earmarked for three development projects could be held up if the government fails to keep up its commitments to the bank. Stepping into this minefield is Albania's new prime minister, Pandeli Majko, who assumed the post for the second time on Feb. 6, 2002, having previously occupied it between 1998 and 1999. Majko now faces the formidable task of trying to stitch Albania together again. Meta, his predecessor, had resigned after the latter failed to resolve a four-month feud with Fatos Nano, the chairman of Meta's own Socialist Party (SP), whom he accused of undermining his government because of a personal vendetta. Speaking to journalists after his appointment, Majko said his "principal priorities are the presidential elections [scheduled for an as-yet undetermined date in 2002], the preparation for the integration into the European Union, and NATO membership." 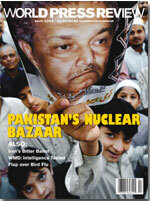 Meta's relationship with Nano began to show signs of strain soon after the Socialists won a second term of office in the June 24, 2001, general elections. Nano, whose position gives him virtually no formal authority in the government but does make him an indispensable power broker, actively sought Meta's support in his bid for the presidency. Meta refused. Perhaps he calculated that Nanowho has twice been prime minister, most recently fleeing to Macedonia when, in September 1998, armed opposition forces rose against his governmentwould be an unpopular choice. In any case, Meta miscalculated. Without the support of the party chairman, Meta's government was crippled. Though he did restore order and improve Albania's neglected roads, without the support of his party, he found he could get little else accomplished. "I present my resignation from the high post of the premier because of the destructive pressure and the unacceptable situation created by the SP chairman, Fatos Nano, and his followers," the 32-year-old Meta told journalists in Tirana on the day of his resignation. Meta expressed concern that Nano's decision to run for president would isolate the country and would jeopardize March talks on an association and stabilization agreement with the European Union. "I cannot vote for closing down Albania's integration and putting the country in quarantine," he said. Nano had criticized Meta for governing with "fascist methods," and last December accused four of his ministers of abusing their powers. The ministers said they were innocent but agreed to step down for the sake, they said, of stability. It was after Nano loyalists blocked the appointment of their replacements that Meta resigned. According to Meta, Nano made approval of their replacements conditional on Meta's support for Nano's presidential bid. Meta had other reasons to despair. Whether or not he was manacled by his clashes with Nano, he had been spectacularly unsuccessful, and few mourned his passing from the political stage. The Albanian news media passed harsh sentence against Meta's legacy: He left Albania in a state of economic crisis, compounded by the country's worst energy crisis in decades, a drop in gross domestic product, and widespread corruption. Not soon enough, said Tirana's centrist daily Shekulli in a Jan. 30 editorial titled "Delay of a Welcomed Resignation." Shekulli's editors passed harsh judgment on his record: charging him with manipulating the elections and ruling over the executive with "a dark shadow." "Moreover," the paper's editors continued, "To plan the identification of the number one of the government with that of the party, to buy the press, to defend corruption, to keep the country mired in an energy crisis… to do each of these things is to throw a snow ball that will turn into avalanche." In its Jan. 30 editorial, Albania, an independent Tirana newspaper with a right-wing slant, also praised Meta for stepping down, saying that the move would be "a fatal blow for Nano." Albania allowed that Meta had been a capable administrator, but that he had wasted too much time shoring up his personal power. Tirana's Korrieri (independent) agreed: by resigning, Meta had "jumped out of the hot seat" and put Nano there instead, the paper's editors wrote on Jan. 30. Albania's political elite echoed the press' praise for Meta's decision. Vasil Melo, chairman of the Union for Human Rights, an ally of the SP, said Meta should have resigned before. "There was no need to lose a month and a half's time to reach the present critical condition," he told reporters on Jan. 29. Ekrem Spahia, chairman of the Legality Movement, an opposition party in the Albanian parliament, blamed Meta's resignation on "the [SP's] unsuccessful economic and social policies, and on the fierce fight for power within the clans of the left-wing majority. We think that after this act, [Parliament] should assemble to discuss ways of getting the country out of this serious crisis the SP and its allies have created." In its Jan. 31 editorial, Korrieri agreed, but rightly worried about the enormity of the task: "What should the government do to ensure that the state administration does not employ only those who want housing credits, those who want to steal, or those who felt themselves unable to work in the private sector? What law should Parliament endorse to rid the word 'tender' of its negative connotation? What laws and steps should be taken to fight corruption? What laws should the Parliament approve to cut off the dishonest relations between business and politics?"